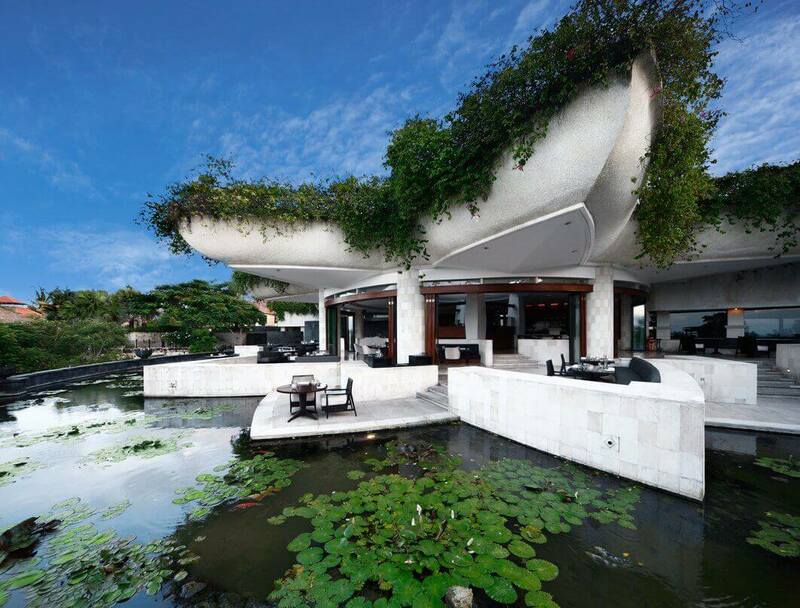 ​Ayana Resort and Spa Bali has installed 150 TeleMatrix brand 9600 Series 9602MWD single-line analog cordless telephones through Cetis channel partner PT Aneka Spring Telekomindo, Jakarta. The award-winning Ayana Resort and Spa is a world–class destination resort located on 90 hectares of cliff-top land perched above Jimbaran Bay, just 10 kilometres from Bali airport. The Ayana features 19 restaurants and bars an exclusive private beach and beach club, 12 swimming pools, and a world-class spa. For your next new construction or renovation project, contact PT Aneka Spring Telekomindo, located at Jl. Pintu Air Raya No. 2F, Jakarta. Call Jetta Hosea at +62213867575 or +62213804182, or click here to visit their LinkedIn page. Click here to view Cetis telephone design families, or here to request a quotation. Choose from 14 distinct Cetis hotel phone design families to complement your guest room decor. Cetis competitors do not offer 14 unique phone design families! ​Cetis offers the hospitality industry's most complete line of hotel phones, designed to complement hotel branding and room decor. 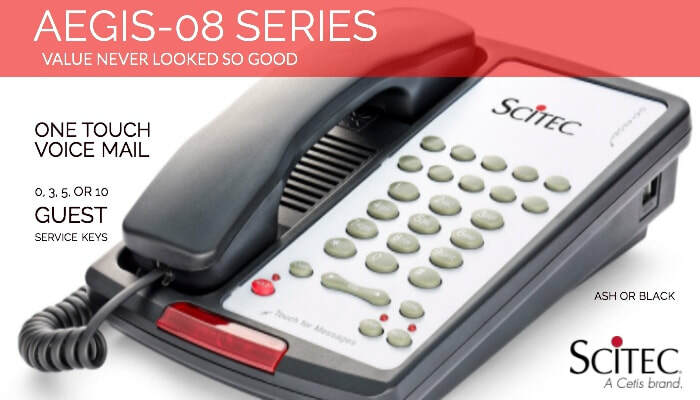 Design families include Teledex D Series, Diamond Series, E Series, I Series, M Series, Nugget Series, Opal Series (7); TeleMatrix 9600/3300 Series, 3100 Series, Retro Series (3); and Scitec Aegis-08 Series, Emergency Series, 2500 Series, H3000 Series (4). 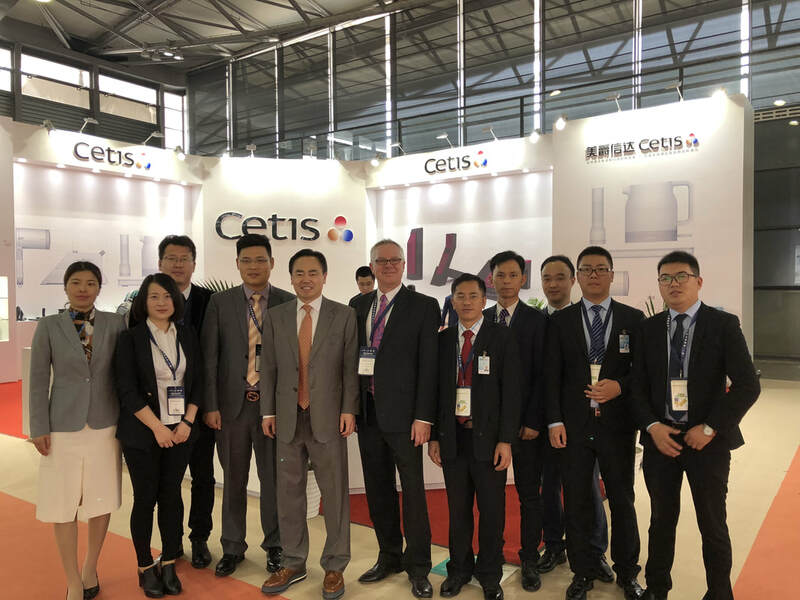 The Cetis Beijing sales team, along with Dr. Sun and Bryce Bowman, exhibited Cetis products at the annual Hotel Plus Shanghai show held at the Shanghai New International Expo Centre (SNIEC), April 26-29. 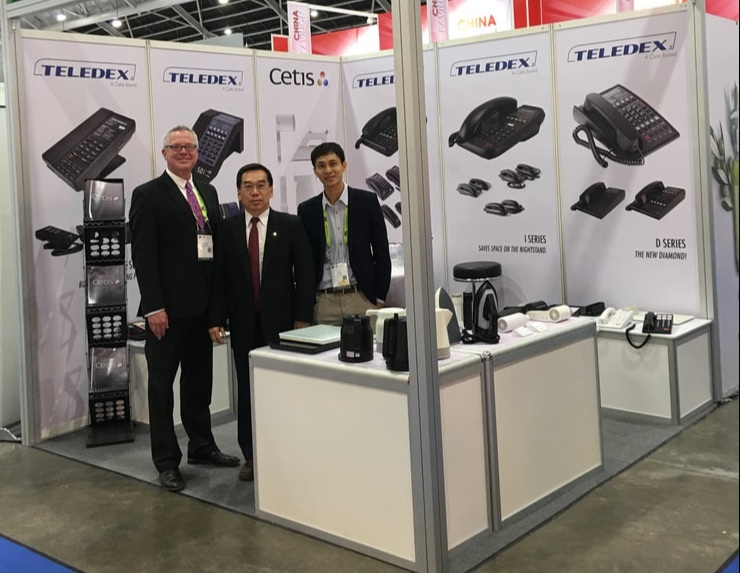 The Cetis Asia sales team with Bryce Bowman, showcased Cetis products at the FHA 2018 show held at the Singapore Expo & Suntec Singapore, April 23-26. Thirty-six years of Cetis history in thirty-six seconds. Complement your hotel brand colors with TeleMatrix brand 3300 Series handset accents. 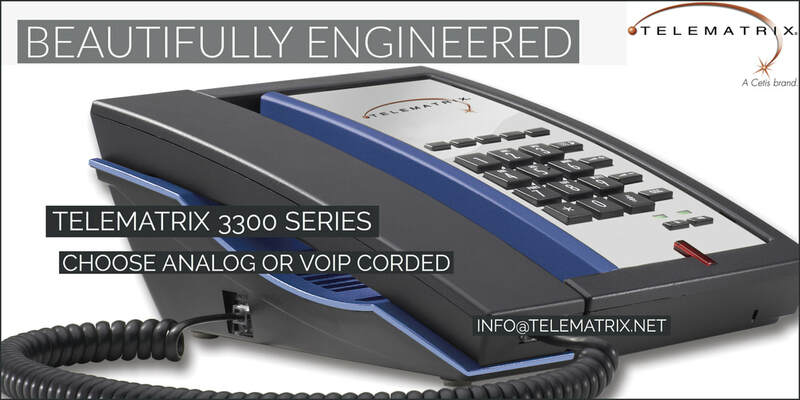 TeleMatrix 3300 Series hotel phones are available in single and two-line analog and VoIP corded configurations with 7 optional standard handset accent colors, a standard PassPort RJ45 Ethernet port, and patented OneTouch voice mail retrieval technology. Choose matching 3300TRM or 3300IP-TRM trim line phones for bathroom and common area applications. Durable Scitec brand economy hotel phones are valued by hoteliers worldwide. Aegis-08 Series phones are known and valued by hoteliers worldwide for their rugged, trouble-free performance. 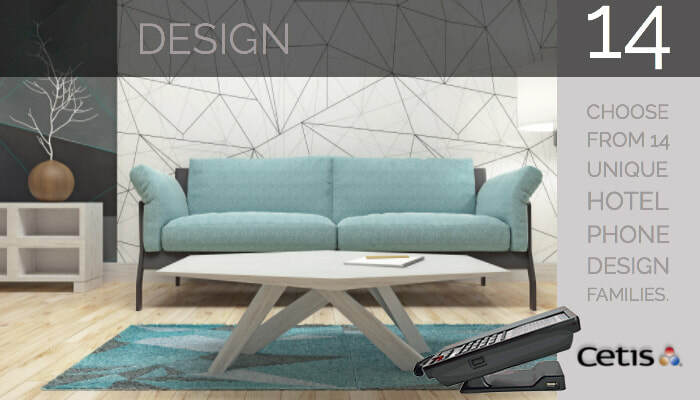 Single and two-line speaker and non-speakerphone models are available with options for 0, 3, 5, or 10 programmable guest service keys, and patented OneTouch message retrieval designed to keep your guest connected with a single touch of the lightbar. ​Click here for details, here to view the video, or here to request a quotation. Teledex E Series micro-footprint phones save space on the nightstand and desk. 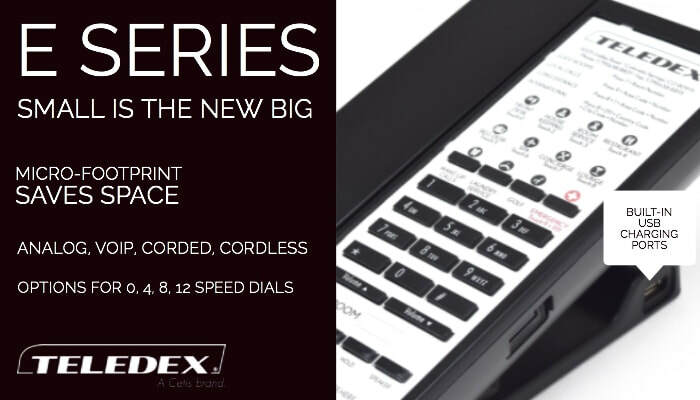 Amazingly big on features, yet surprisingly small in size, Teledex E Series hotel phones are 40% smaller than standard guest room telephones, creating an entirely new category in hotel telephone design. E Series flat panel, compact style adds a touch of elegance to any room without compromising functionality. Add USB charging ports to help guests charge personal smart devices.